Wild Goose Qigong is a complete system of healing practice with warm-up exercises that open all channels and meridians in the body. This practice also includes acupressure massage for opening blockages, meditation, and the practice of the 64 movement sets. All these reflect the life-style of the Wild Goose. 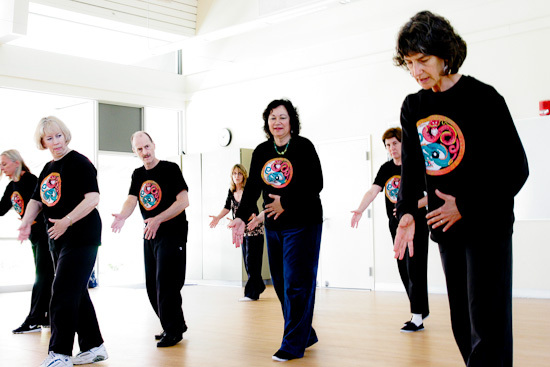 Students begin by learning the first movements of the Wild Goose form in the fall quarter and continuously learn the rest of the movements by the end of spring quarter. An instructional video- Dayan Qigong, made by Master Hui Liu, can be ordered through www.wenwuschool.com. A Wild Goose Qigong Practice DVD can be ordered through dove@dragonartsstudio.com. Note, no instructions are included.